Submitted 2 weeks 18 hours ago by feeds_user. 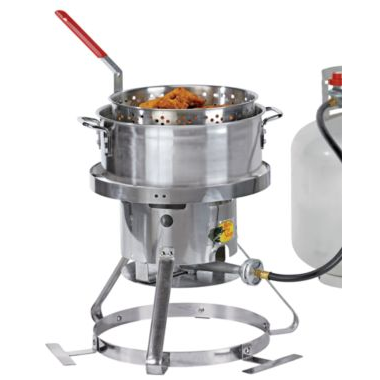 Bass Pro ShopsÂ® Stainless Steel Fish Fryer Powerful, affordable and popular outdoor fryer 10.5-qt. stainless steel pot Stainless steel strainer basket with cool-touch handle 58,000-BTU high-efficiency burner 5'' deep-fry thermometer Combining a popular design with durable stainless steel construction, the Bass Pro Shops Stainless Steel Fish Fryer helps you fix great food at a great value. The 18'' stainless steel tripod stand has a wide, stable base with three additional stabilizer feet. The heavy-duty 10.5-qt. stainless steel fry pot features dual side handles. The lightweight stainless steel strainer basket comes with a rubber-coated handle for comfort and a clip at the rear base to allow you to drain the food you fry or boil. Durable high-efficiency burner cranks out 58,000 BTU. Cooker also comes with a CSA-approved regulator and hose, plus a 5" deep-fry thermometer. Runs on 20-lb. propane tank (not included). Wt: 14.3 lbs.